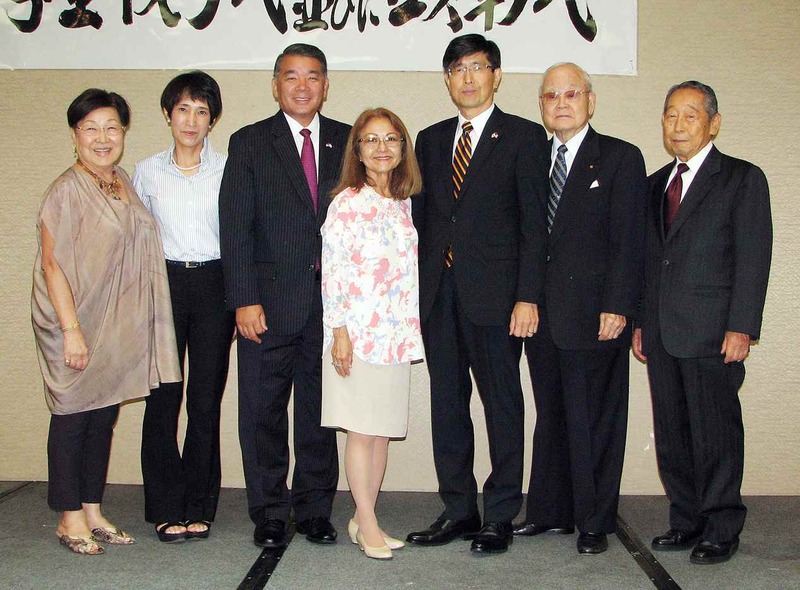 MONTEBELLO — The Japanese American Treaty Centennial Scholarship Fund presented scholarships to 20 students and also gave special recognition to longtime supporters during a luncheon held July 30 at the Quiet Cannon in Montebello. • Dr. and Mrs. Jack Naito. Dr. Naito is a SBD Group chairman and investment commercial business building owner. Since 2002, he has been a generous donor and consultant to the Japanese American Scholarship Fund. He is an advisor for the Japanese American Cultural and Community Center, Kansai Club, ikebana and tea ceremony groups, and other organizations. He has served as president of Orange County Japanese American Association for more than 12 years and was involved with Lions Club of Orange for 15 years. The Naitos also continue to welcome students from Japan into their home. This year, Dr. Naito is celebrating his 90th birthday as well as 68 years of marriage. “This is a great honor and privilege … I will be trying my best to contribute to the further growth of our community,” Naito said. • The Kiyoshi Takemoto Memorial Fund, which was established in 2008 on behalf of Kiyoshi “Kiy” Takemoto by his wife, Susie Takemoto. Kiy was born in 1934 in Watsonville and was incarcerated with his family in Poston, Ariz. Despite humble beginnings, he and his siblings achieved their educational and professional goals. He married Susie in 1963 and although they had no children of their own, it was very important to him to reach out to young people. Many high school and college students who worked for him in his pharmacies sought his advice and guidance. Kiy shared the same vision that his parents instilled in him, that of recognizing the importance of gaining knowledge through education. Susie Takemoto accepted the award on behalf of her late husband. • Tetsuo Takahashi. After a long, successful career with Mitsui & Co., Takahashi joined the Japanese Chamber of Commerce of Southern California as administrative director in 2000, when Tom Kamei was the president. Takahashi remembers Kamei as “a man of conviction” who “taught me how we should work with our community as a nonprofit organization.” After retiring from the JCCSC, Takahashi continued to support the JCCSC and JCCF by volunteering in the office and overseeing administrative and financial matters. He has been instrumental in supporting the JATCSF program. “I’ve watched many brilliant young people receive this award and I hope we can continue this wonderful program for years to come,” Takahashi said. The keynote speaker was Terry Hara, the first Asian American deputy chief in the history of the LAPD and a recipient of the Japanese government’s Kunsho award. See previous article for profiles of the JATCSF scholarship recipients.